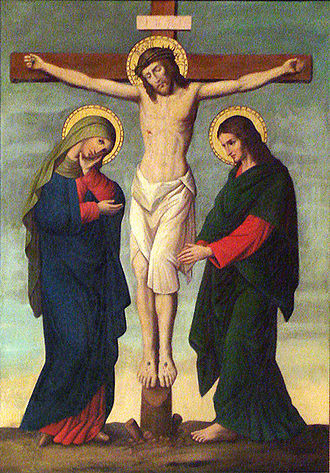 Image: Crucifixion, part of a series depicting the stations of the Cross. Chapel Nosso Senhor dos Passos, Santa Casa de Misericórdia of Porto Alegre, Brazil. Oil on canvas, 19th century, unknown artist. I'm glad you like it, Helen. They are two of my very favourite singers and together they make a sublime sound. Exactly, Yam. I hope you too have a blessed day. Thanks, Sally. The same to you both. So beautiful, thank you and Easter Blessings Perpetua. It really is sublime and I'm glad you enjoyed it, Trish. Easter blessings to you both. I had quite forgotten I had ever sung this duet, but I sang the alto in Oxford many years ago. Wonderful to hear it again. I have neglected Pergolesi of late. A peaceful and contemplative Easter to you, Big Sis. I'd love to have heard you sing it, Marion. Emma Kirkby and James Bowman are two of my favourite singers and I love hearing them together like this. As you know, I sang in a choir at Oxford in the mid-60s and a young James Bowman, at the very beginning of his career, was one of the soloists when we did Orff's Carmina Burana. I've never forgotten it. Dear Kathy, thank you. Peace. I'm glad you liked it, Dee. Beautifully rendered and soft to my ears on this late Good Friday afternoon. Thank you for posting this, Perpetua. Happy Easter. I thought it would speak to you, Penny. Happy Easter to you and Tom. Beautiful duet, Perpetua. I've just enjoyed listening to it this morning, (Holy Saturday). Perfect preparation in advance of putting the liturgy together for the Easter Day Eucharist in Dresden & writing my sermon. It's one of my recent lovely discoveries, Ricky. Glad you enjoyed it. I hope the service preparation has gone well and that you will have a very joyful and blessed Easter celebration in Dresden.